Of all the non-championship races run to F1 regulations the Race of Champions is perhaps the best known. Still it's not the one with the biggest history file to take a leaf or two from - that honour is shared by the International Trophy and the Syracuse GP. From its inception in 1967, when Dan Gurney won the inaugural Race of Champions, the Brands Hatch traditional has however almost always managed to get its top-class field to stage a terrific show. Several epic editions spring to mind, with a few surprise victors. What about Peter Gethin taking a Chevron-Chevrolet to victory in 1973? Or the win Tom Pryce pulled off in his Shadow two years later? Keke Rosberg took the last Race of Champions at a very wet (what else?) Brands in 1983, his first win as reigning F1 champion, a rather fitting accolade to the very last of the non-championship races. The picture shows another champion who won an edition of the Race of Champions, though not in the year depicted. The late sixties and early seventies were an era of unbridled experimenting and here we see the opportunity Team Lotus took in testing their sensational turbine 65B in anger. The Pratt & Whitney experiment was the last in a line of F1's weird science which also included four-wheel drive, a project embarked on by various constructors. Just as its Indycar predecessor the 56B incorporated both 4WD and turbine innovations. Although most of Colin Chapman's ideas were ahead of their time, some of them went to waste - in a big way. The turbine experiment was certainly one of them, his young driver crew taking turns with the 56B. All they proved was that it wasn't as clear-cut as it seems to be to take a leaf out of Lotus' Indy textbook and insert in a design file of a Grand Prix contender. In dry conditions, however, performance suffered from the car's weight handicap. Swede Reine Wisell volunteered at the British GP, ending up a non-classified runner 11 laps down. 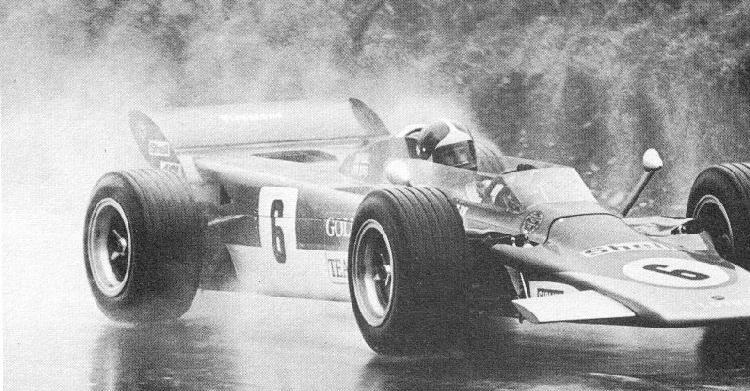 Emerson Fittipaldi raced it only once in a World Championship race: Monza '71. He undoubtedly did his best, qualifying a respectable 18th and finishing (yes, finishing!) the fragile machine a classified 8th. The 56B's debut also saw Fitti at the wheel, setting 2nd fastest time in the wet first practice. In qualifying and the race, both run in normal conditions, the car again lacked ultimate pace.